Last year, New York Governor Andrew Cuomo excitedly discussed plans to illuminate seven bridges across New York City with multicolored LED lights choreographed to music. Those bridges, along with the Empire State Building and One World Trade, were first slated for installation in winter 2017. Now, among massive stalls and shutdowns at MTA stations across the city—dubbed “the summer of hell” for commuters and tourists alike—critics are gearing back up to question how the city is spending on public infrastructure. A spokesperson for Governor Cuomo, Jon Weinstein, emailed Politico to say the bridge lighting project “is definitely NOT being paid for by the MTA,” indicating the costs could be split between the New York City Power Authority and Empire State Development. The MTA and the New York Power Authority (NYPA) seem to think otherwise: In March, the NYPA’s Board was shown a $216 million estimate for the plan with the MTA picking up the tab, although this was an unaudited financial plan with the project cost as a placeholder. Critics have been quick to distinguish cosmetic from reparative lighting—for instance, bridge and tunnel fixtures repaired after Hurricane Sandy. For example, recent upgrades to one of these post-Sandy projects, the rehab of the tunnel and exit plaza on the Manhattan side of the Queens Midtown Tunnel, included $7.3 million in additional funds to create a decorative blue-and-gold tiling pattern that reflects the state’s official colors. Additionally, the Port Authority has officially withdrawn the George Washington Bridge from the lighting portion of the collective plan, which has been dubbed New York Crossings. However, that initiative doesn’t end with its lights. 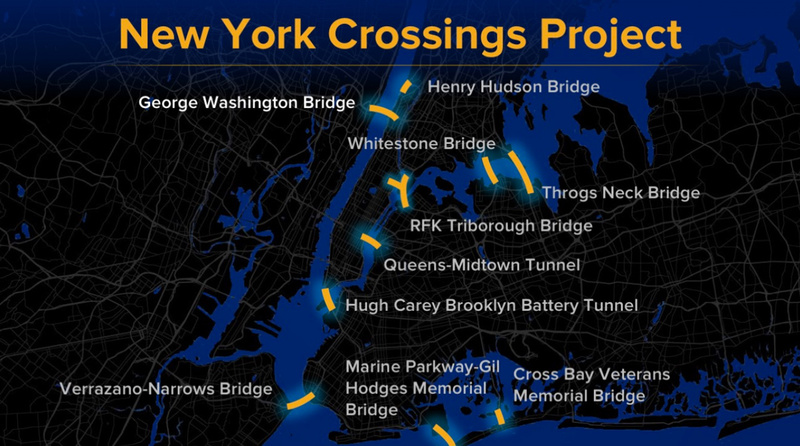 The governor’s office has framed New York Crossings as a public art project that would address a number of other civic concerns: incorporating automatic tolling designed to reducing commute times, increasing checkpoint security (through facial recognition software at these stations), seismic updates to each bridge (the plan also incorporates reinforced concrete armoring units underwater), and sustainability (introducing LED units wherever possible). The projected end date for New York Crossings is currently May 2018, even as the governor’s office claims the MTA is spending no money on the initiative. An independent review by watchdog group Reinvent Albany estimated the agency has spent roughly $40 million on the decorative towers and LED lighting so far.